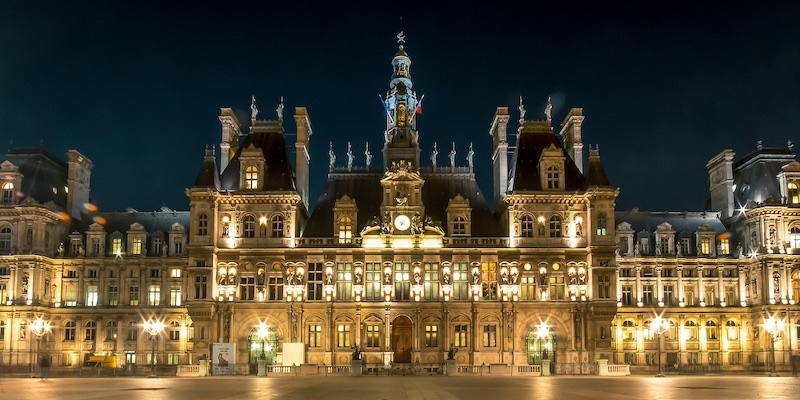 The Hotel de Ville — that is, the Paris city hall — is one of the enduring landmarks in the city and it's been that way since the mayor of Paris first moved to the site in 1357. Initially, the seat of Paris city government was in the house owned by whoever was mayor. It wasn't until 1533 that the French king Francis I decided to grace the city with an Hotel de Ville that suited the capital of France. Over the centuries the building was completed and expanded. 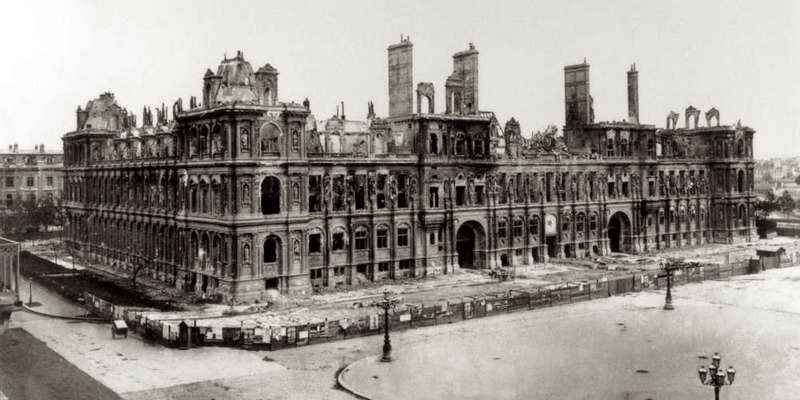 But, in 1871 Hotel de Ville Paris was set afire during the Paris Commune as a result of a clash between Communards and the central government. It took twenty years, but the city hall was rebuilt inside of the original stone shell, which was all that remained after the fire. This is the version of the city hall we see today. We always make a visit to the Hotel de Ville, whatever the season — it's one of those places in Paris where there's always something happening. 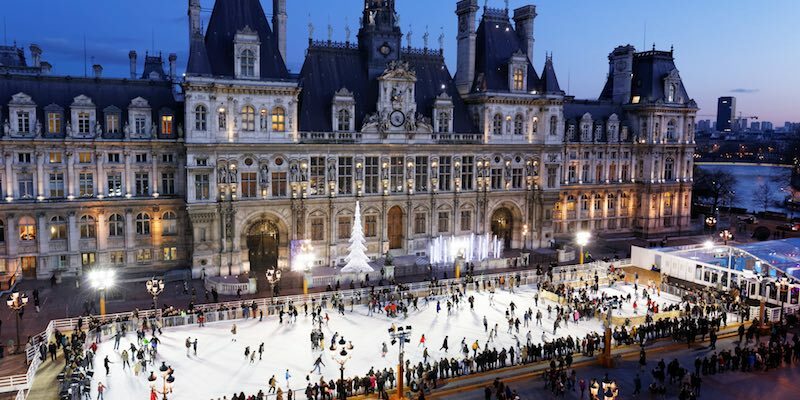 The large place in front of the building (built by Baron Haussmann, and known as parvis de l'Hôtel de Ville) is spacious enough to hold the seasonal patinoire — Christmas in Paris is made even more magical with this outdoor skating rink right in the middle of Paris! 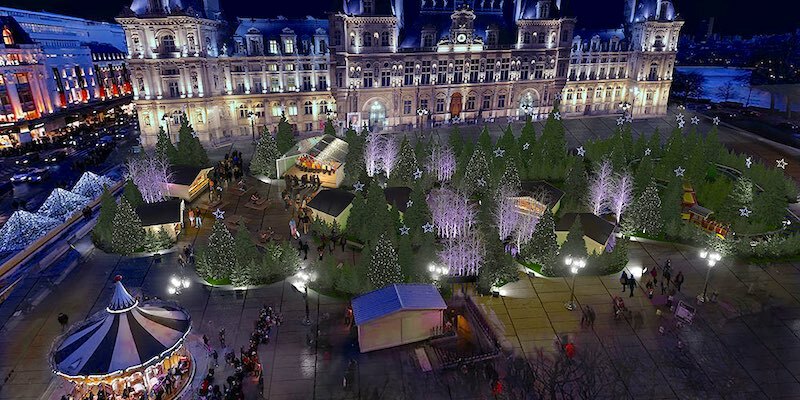 In some years a complete Noel village is created in the parvis. When our son was little he loved to ride on the turn-of-the-century children's carrousel that is permanently set up on the place. It has horses and lovely deep booths. That's not to say that the parvis de l'Hôtel de Ville has always been a pedestrian paradise. 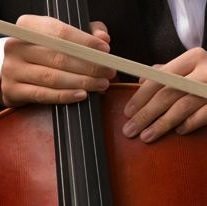 (Remember the guillotine?) 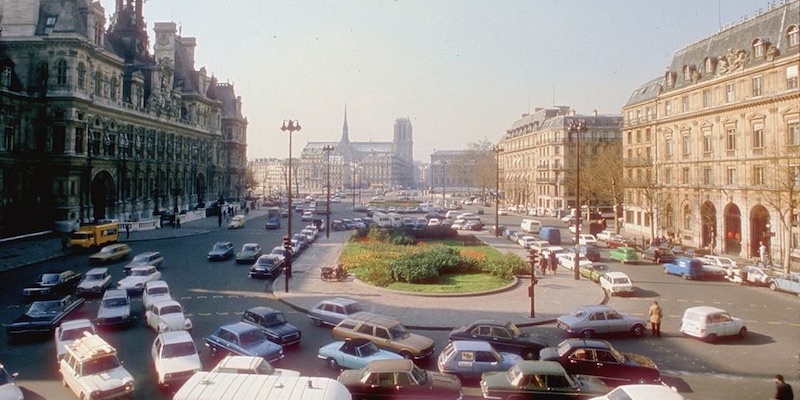 In that car-crazy urban planning era of the the 1950s, 60s, and 70s the space in front of Hotel de Ville was a parking lot, surrounded by a circle of busy traffic. Pedestrians who wanted to enjoy the small park risked life and limb to get there! These days there's often an interesting exhibit inside the city hall itself. When the Les Halles are was undergoing its recent reconstruction, the city hosted an exhibit of the photographs Robert Doisneau shot when Les Halles was the Paris central market. During important national sporting events large screens have been set up in the parvis for public viewing. Being in the center of the city, the Hotel de Ville is surrounded by a lot of interesting buildings and quartiers including the Pompidou Center, Notre Dame Cathedral, the Islands of the Seine, the Marais, and the book merchants (les bouqinistes) that line the banks of the Seine river. 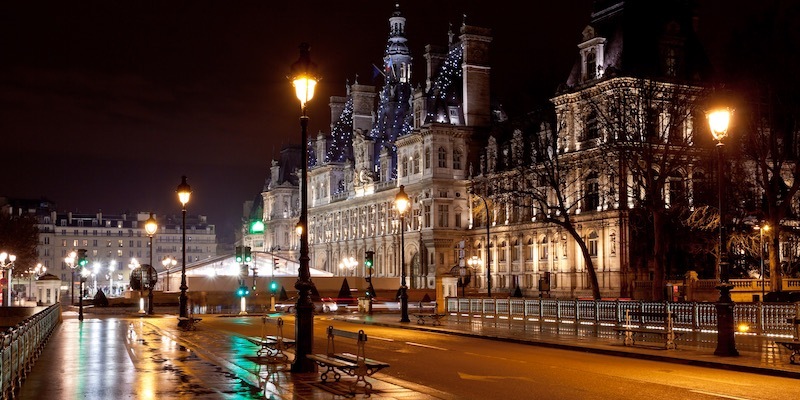 The Hotel de Ville is included in a small-group walking tour that takes you on a nighttime journey to hidden Paris. We love this sort of guided tour — we discover off-the-beaten-path streets, narrow alleyways, and tucked-away buildings — while learning about the violent and dark history that lurks beneath the City of Light. 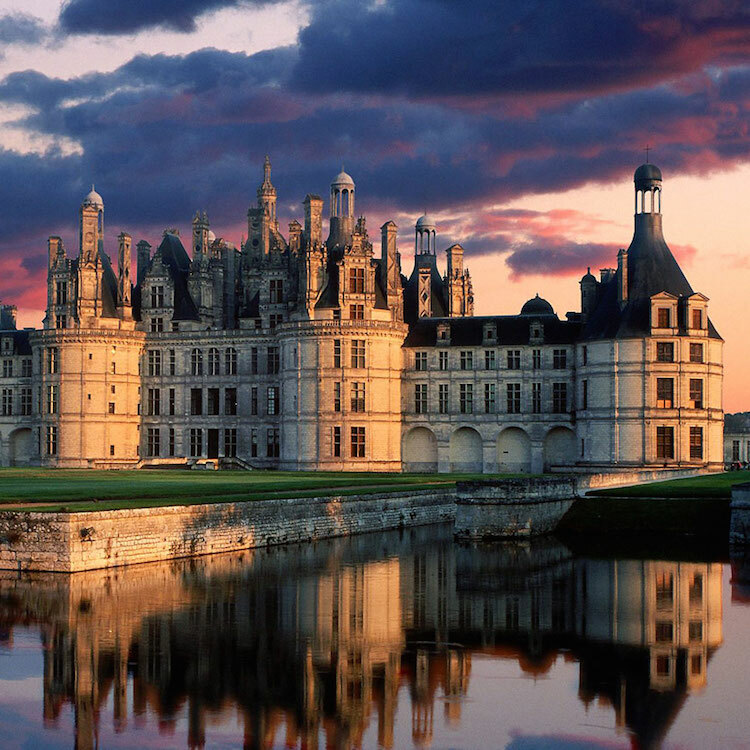 The history of Paris includes the plague, the French Revolution, the Paris Commune and the Nazi Occupation. 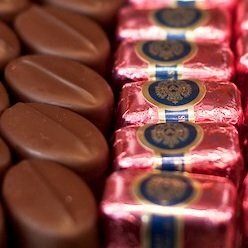 It's on this kind of walking tour that you really get a feel for the icons that shaped the city, from early French kings Chlothar the Old and Clovis the Lazy to Napoleon and Marie Antoinette. Ghosts, Mysteries and Legends: A Night Walking Tour of Paris visits the Hotel de Concierge, where Marie Antoinette was imprisoned, and travels to the Hotel de Ville, site of executions and hangings. It even takes in the Rat Trap Shop featured in the movie Ratatouille.